The first Elementary M.U.S.C.L.E. Education launched five years ago. There have been five more since the first one. It’s a slow burn. I don’t have anything to more to say about the $3,113 post. I feel like I shared all my feelings about the price in the post. Auction Watch #116 was especially interesting to me because of the recent Auction Watch #227. The picture from the Epilogue still makes me laugh. 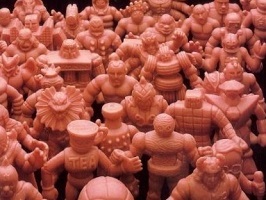 Elementary M.U.S.C.L.E. Education – How Many Figures In a M.U.S.C.L.E. Set? This entry was posted on Saturday, October 28th, 2017 and is filed under UofM News. You can follow any responses to this entry through RSS 2.0. You can skip to the end and leave a response. Pinging is currently not allowed.